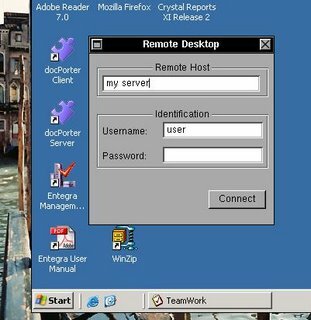 Need to access your remode desktop on windows? rdesktop is your tool. Since it is tedious to remember every time all the command line options to specify the server and username, a small interface is a nifty think. Xfce and Debian isntalled me a working one, but I do not like the look of it, it has several bugs and quirks.... and it is GTK2. So, let's objective-C, Gorm and in GNUstep and a small working app popped out. It is usable already and I wills oon release a 0.1 release, in GAP, I hope other people will like it too. The CVS is already public. Of course, several features are needed to make it top-notch, but they will follow, stay tuned. Woah! I hacked in kaffe awt up to deep in the night. The rendering of strings inside textfields was broken since a long time! The cursor and the typing was wrong, once enter was hit it worked. I didn't have big hopes to fix this and I just tried to have a quick look. I discovered that the java part considered the fonts fixed width even if it wasn't and thus returned the wrong charWidth. Without much understanding and even lesser hope I messed inside the native methods! I was able to understand the faulty logic and implement a new one by accessing the XFontSets and font structures. I queried my first X Atoms! Although my implementation now is not very robust I think it is definitively correct and now the character width is computed correctly. The lack of robustness is due that I take the first font struct of a fontset, from a XOC. 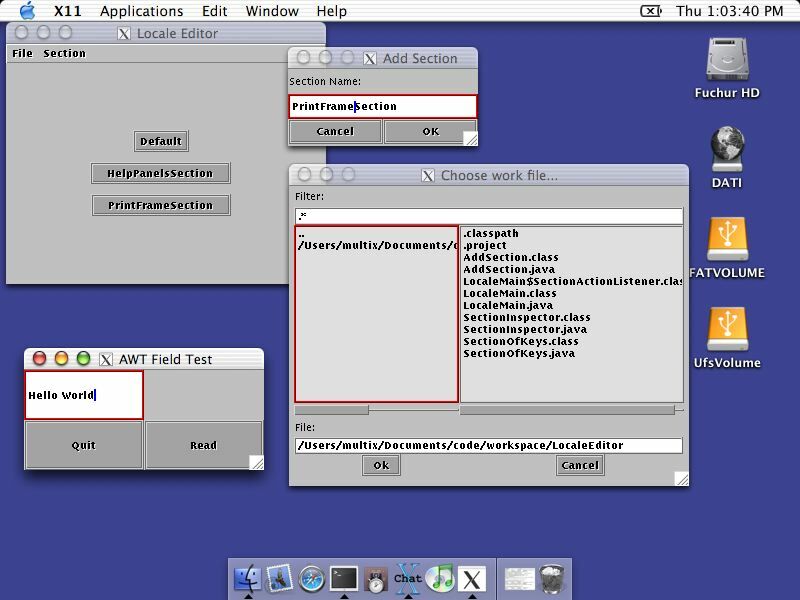 in the compulsory screenshot our AWT is running happily on Darwin X11 on MacosX 10.2.8... you may notice how nice the text fields and the file dialogs are! I was able to fix further problems in the kaffe AWT ilpementation and to integrate it furthermore with classpath. Radiobuttons do work now and menus started to be usable too! Most Layouts seem correct too. 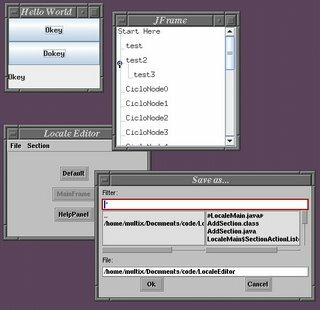 Unfortunately some other compontents (like the tabbed pane) still don't work and I don't know how to solve the problem. The attached screenshot shows the portability of a swing that uses directly X11: it is running on Irix on a SGI Indigo2. Take the latest-and greatest unstable, unreleased GNU Hurd from Debian (this will give you an improved libc and thread library that doesn't require certain hacks to make some un-Posix code to work). Install it (and cross your fingers). Install of course the objective-c compiler. Install the necessary dependencies (libxml2, libpng, ffcall) witht ehir developer headers. 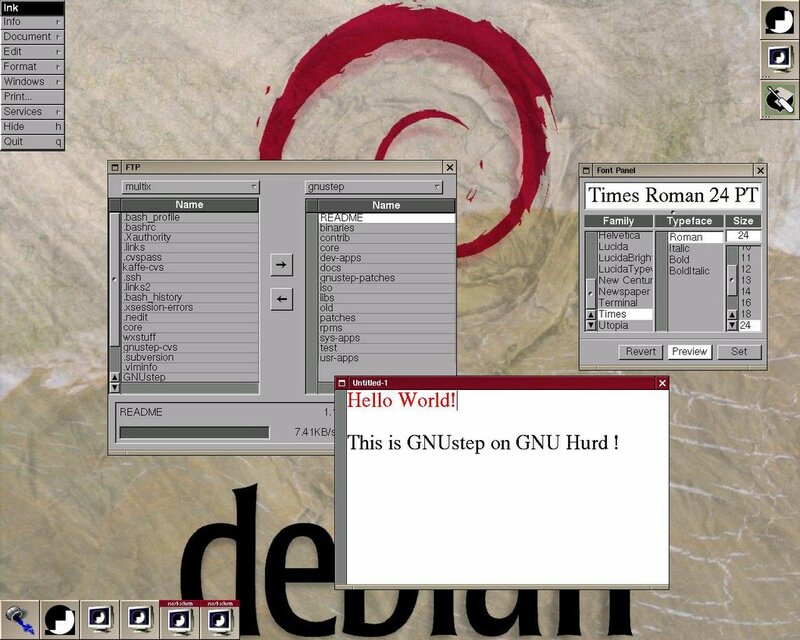 Then get the latest GNUstep. 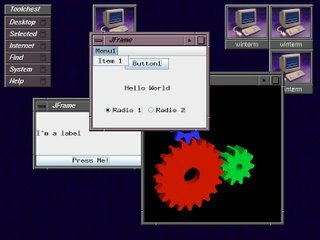 Configure and install make, base, gui and make. I used the xlib backend. Now some caveats: the base library needs to be hacked. More specifically, after you have run configure, modify Sources/config.h and define BROKEN_SO_REUSEADDR to 1. Also I experience some troubles with the daemons of GNUstep, not only on HURD but elsewhere too, thus manually start gdomap and gdnc. Now you are ready to start your applications! install one, run "make_services" so that it is registered and then launch it with "openapp NAME" or "gopen NAME.app". Inside the gnustep repository there is the workspace manager (a must have, but currently it crashes here) a small RTF text editor Ink (favourite small app to test if GNUstep is working...) and there are many nice applications in the GAP project and from Backbone. So the edges are a bit rough yet. But it starts to be there, I'm excited.